Hi! 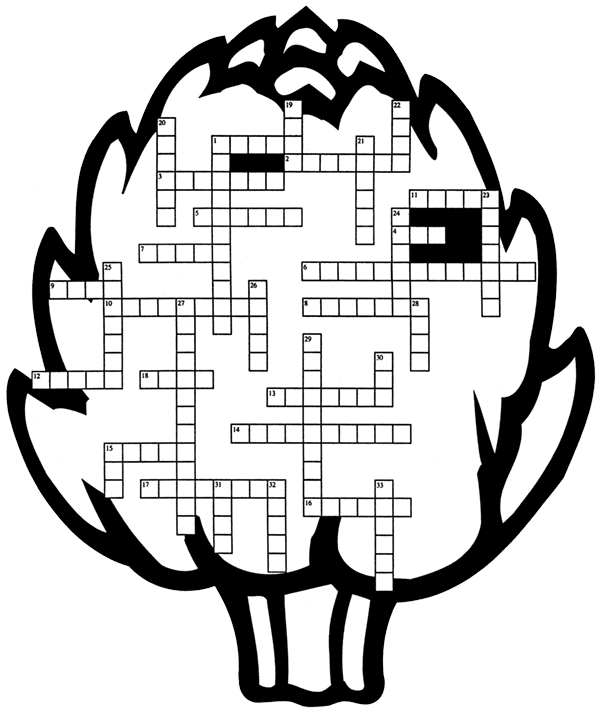 When you finish doing my crossword puzzle, check out the artichoke page on the CFAITC website. Our friends at the California Foundation for Agriculture in the Classroom have some great information! Click the links below for the Crossword Puzzle, the clues, and the answers. This will bring up a new broswer window to print or save the image. We have also included the clues on this page so you can work online. Have fun! What some people call the fuzzy center of the artichoke. The country across the English Channel that got the artichoke from France. Artichoke plants are planted in a _ _ _ and watered and nourished by farmers. The leaves that we eat on the artichoke bud. Artichokes were grown by Ancient Romans and Greeks near this sea. The artichoke _ _ _ _ _ has roots, a stalk, stems, leaves, buds and petals. Lists of ingredients and directions used to prepare food. A unit of land measurement. A delicious vegetable that counts as one serving of your 5 A DAY goal. Vegetables are grown by planting a sprout, seed, or _ _ _ _ _. Immigrants from this country brought artichokes to California. The shape of the new U.S. Department of Agriculture food guide. The Food Guide Pyramid says we should eat three servings of these daily. Artichokes contain _ _ _ _ _ that helps keep our digestive system healthy. 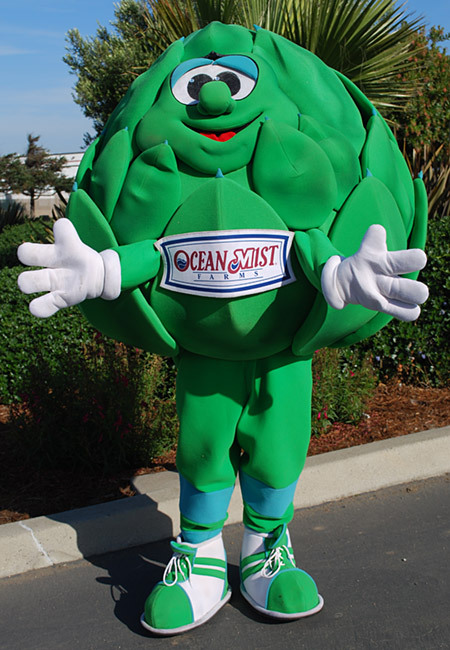 California grows virtually 100 percent of the artichoke crop in the United _ _ _ _ _ _. These nutrients are characterized by letters such as A, B, C, D, and E.
Nutritious foods keep us healthy and help us _ _ _ _. Eating artichokes is _ _ _.
Artichokes are fat- _ _ _ _. Eating 5 servings of fruits and vegetables may help prevent this disease. The city called the "Artichoke Center of the World" is _ _ _ _ _ _ ville. Farmers usually plant root cuttings or "stumps" to start new artichoke plants. Other vegetables are often started from _ _ _ _. The nutrient that is necessary for growth and maintenance of our bodies. A Mediterranean country that grows artichokes. A varied and balanced diet, along with daily exercise will keep us _ _ _ _ _ _ _. The edible center of the artichoke bud. 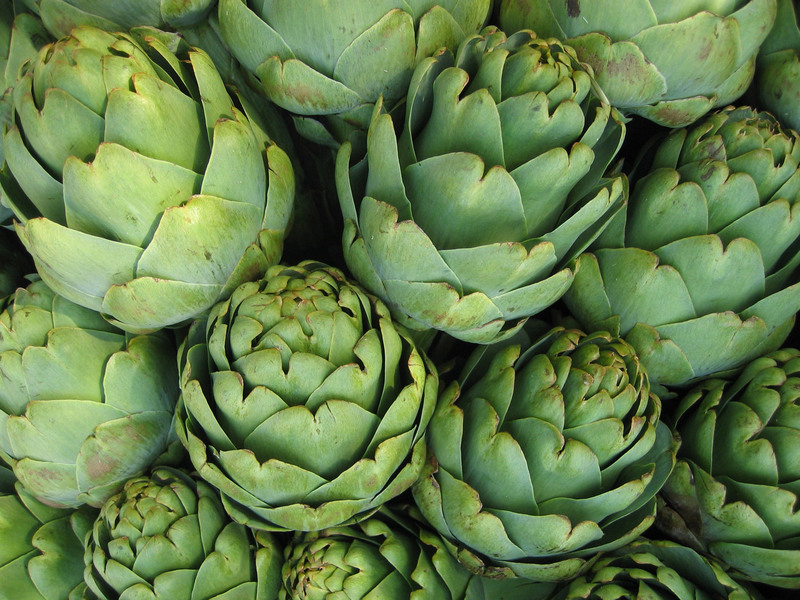 This nutrient in artichokes provides our bodies with quick energy. The long, tall part of the artichoke plant that carries nutrients from the roots to the bud. Artichokes are fun, delicious and _ _ _ _ _ _ _ _ _ _. The edible part of the artichoke plant that has petals and a heart. A listing of foods available at a restaurant. The size used to describe "baby" artichokes. The artichoke character in these lessons is called _ _ _ _ _ _ Arty because it represents something that is good for our health.